Celebrating 32 Years of Excellence! 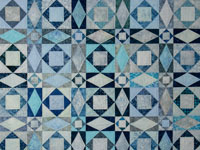 While there are many fine quilt designers in Lancaster, C Jean Horst's quilt creations stand out from all the others. Her ability to select fabrics is phenomenal. Her original appliqué designs are stunning. Jean tells how her mother taught her, at the age of five, to use her sewing machine to make doll clothes. She has been sewing ever since. 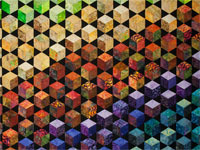 Yet it was on a family vacation 33 years later that she first discovered the creative and colorful world of quilts. In spite of living in Lancaster County, Pennsylvania, the quilt capitol of the world, she purchased her first pattern while on vacation in Tennessee. Hello quilt loving friends. I have a brand new option for all you who love gifting quilts. 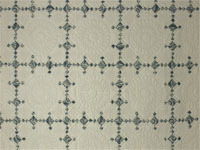 There is now a beautiful embossed gift certificate available to specify an dollar amount and a quilter of your choice. Please email directly to cjh@amishcountryquilts.com if you are interested in C Jean Horst Quilts so we can discuss the details and make them suitable for your situation. We will then fill them in and send you the certificate in an envelope to present to the recipient. We will be happy to serve you in this way if you are interested in a bed size quilt. A sharp but stunning design in beautiful 100% cotton fabrics in shades of blues and light, almost white/ sandy neutrals - flowing into a great blending falls of 24 100% quilters cotton fabrics. It will definitely be the centerpiece of any bedroom. Gorgeous fabrics selected by the quilts designer C Jean Horst. Well made with excellent patchwork sewing. 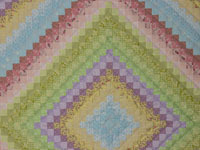 This quilt is beautifully hand quilted using 8 hand stitches by a local Amish woman. Signed by CJH, it's designer. 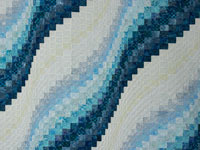 A sharp but stunning design in beautiful 100% cotton fabrics in shades of blues and sandy, almost white neutrals - flowing into a great blending falls of 24 100% quilters cotton fabrics. It will definitely be the centerpiece of any bedroom. 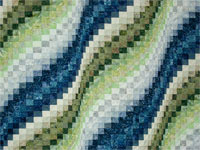 Gorgeous fabrics selected by the quilts designer C Jean Horst. Well made with excellent patchwork sewing. This quilt is beautifully hand quilted using 8 hand stitches by a local Amish woman. Signed by CJH, it's designer. Subtle, soft and sophisticated! A WOW of a Wedding or Anniversary Present! Note the interesting collection of 100% cotton charming delicate to strong blue batik prints on ivory selected for this quilt. 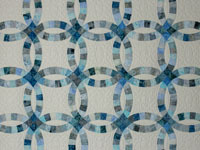 Will work well with many blue coloring schemes. Well pieced and quilted by a Lancaster Amish woman. Signed and dated by its creator, the well respected quilt designer, C Jean Horst of Lancaster. Subtle, soft and sophisticated! A WOW of a Wedding or Anniversary Present! 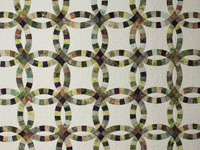 Note the interesting collection of 100% cotton meadow greens and plum prints on ivory selected for this quilt. Will work well with many coloring schemes. Well pieced and quilted by a Lancaster Amish woman. Signed and dated by its creator, the well respected quilt designer, C Jean Horst of Lancaster.